Andykins "A to the Z"
Andykins is a Smash 64 player from Michigan where he is ranked 3rd in 2017. 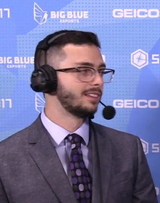 He is also known as a frequent commentator at smash events, e.g. at Shine 2017. This page was last edited on July 29, 2018, at 19:25.